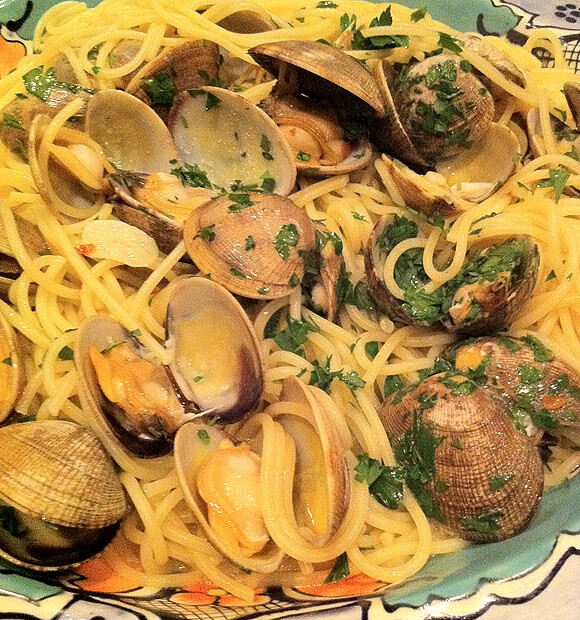 I grew up eating clams and spaghetti made with canned clams and bottled clam juice...delicious for sure but not the ingredients I wanted to use the first time I cooked this dish. I wanted the real thing; live clams and sauce made of naturals juices; enhanced with some white wine and crushed red pepper. So a few weeks ago I made it my mission and set out to reinvent what I had always known as clams and spaghetti. 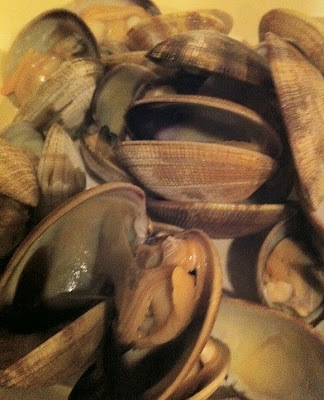 I got fresh clams from Whole Foods Market; farm raised above the sand so they needed no cleaning. I purchased a nice Pinot Grigio; because that's my white wine of choice for cooking. I crushed some hot red peppers from my garden and mixed it all with one of my favorite pasta brands; De Cecco. I followed a recipe from Mario Batali's Molto Gusto cookbook and turned out this woderful bowl of clams and spaghetti. I'm submitting this to Presto Pasta Night being hosted this week by Jennifer from the blog For Such A Time As This. Stop by this Friday and check out the round-up of delicious pasta recipes. Fill a large pot with water and bring to a boil over high heat. Add 3 tablespoons salt; return to a boil. Meanwhile, heat oil and garlic in a large pot over medium-high heat. Cook, stirring, until garlic is softened, about 1 minute. Add wine, red-pepper flakes, and clams. Cover and cook, shaking the pot occasionally, until clams open, about 5 minutes. Transfer clams to bowl as they open; discard any unopened clams. Add pasta to boiling water and cook, according to package directions, until just al dente. Drain, reserving about 1/2 cup pasta water. I have never cooked with live clams, so this is a little intimidating to me, but it sure does look and sound fantastic! Wow...I'm drooling. This takes clams to a whole new level of yum! Thank you for sharing this recipe. I'm eager to try it out on my own. I love visiting your blog before my work day. I need to begin with a smile :-) Have a wonderful rest of your week! I've been thinking about preparing clams at home lately, so funny that you posted this recipe! Will be bookmarking this one! Yum, and Grumpy would love this dish too. He loves fresh clams! Great effort to use fresh clams instead of canned clams. I'll definitely try this recipe and see if my family will like it. I have never used clam in my pasta recipes, but since my catering clients are asking for more choices, I will try to cook it to see if it really taste good.